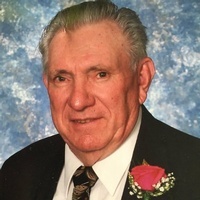 John Reynolds, age 82, Joplin, passed away on Friday, March 16, 2018 at his home. John was born August 31, 1935 in Anderson, Missouri to the late Henry Reynolds and Dorothy Drake Reynolds and had lived in Joplin most of his life. John owned and operated J.E. Reynolds and sons construction for over forty years. He also pastored Bethel Apostolic Church from 1989 until he retired in 2011. John was a master craftsman and loved building cabinets in the new homes he built. He was a veteran of the Vietnam War, serving in the United States Army. He was currently a member of Life Point Pentecostal Church of Joplin. John married Shirley Gillion on November 26, 1955 in Neosho. She survives at the home. Additional survivors include two sons, Johnny Reynolds and wife, Becky, Joplin, Mark Reynolds and wife, Rhonda, Joplin; grandchildren, Stephen Reynolds and wife, Faith; Caleb Reynolds and fiancé, Brooklynn; Ethan Reynolds, Elijah Reynolds, Abigail Reynolds; great grandchildren, Grant Reynolds, Lane Reynolds, Landon Reynolds; siblings, Everett Reynolds, Neosho, Herb Reynolds and wife, Betty, Neosho, Ruth Smith, Chiefland, Florida, Lucille Boyd and husband, J.D., Neosho, Ella Mae Smith and husband, Don, Carthage, Jean Baublitz, Aurora, Joyce Malone and husband, Jim, Neosho, June Lewis and husband, Ted, Carthage and many other extended family members. In addition to his parents, John was preceded in death by a sister, Pearl Spence; three brothers, Joe, Kenny and Henry Reynolds, and a sister-in-law, Rosalie Reynolds. Services are planned for Friday at 1:00 p.m. at Life Point Pentecostal Church. Pastor Fred Oates and Rev. Robert Sill will officiate. Interment will follow at Ozark Memorial Park Cemetery. Pallbearers will be Stephen Reynolds, Ethan Reynolds, Caleb Reynolds, Elijah Reynolds, Ryan Kirk and Wyatt Hettinger. The family will receive friends Thursday from 7-8:00 p.m. at Parker Mortuary Chapel. Arrangements are under the direction of Parker Mortuary.